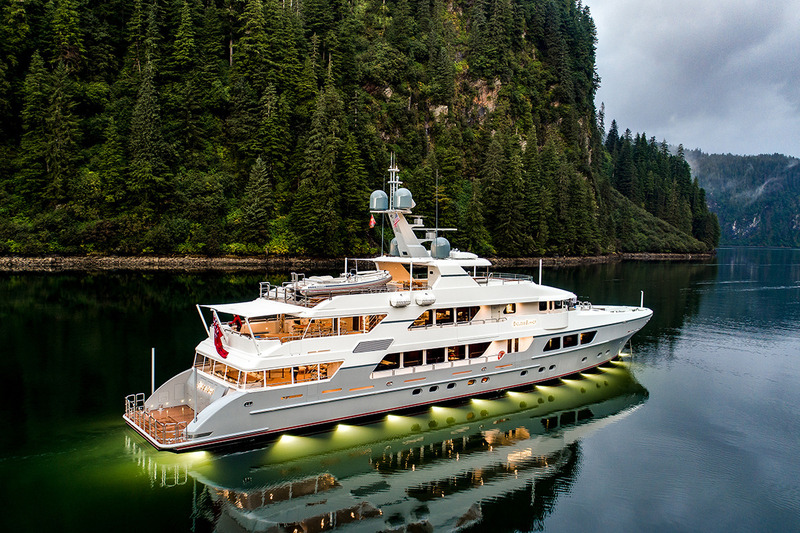 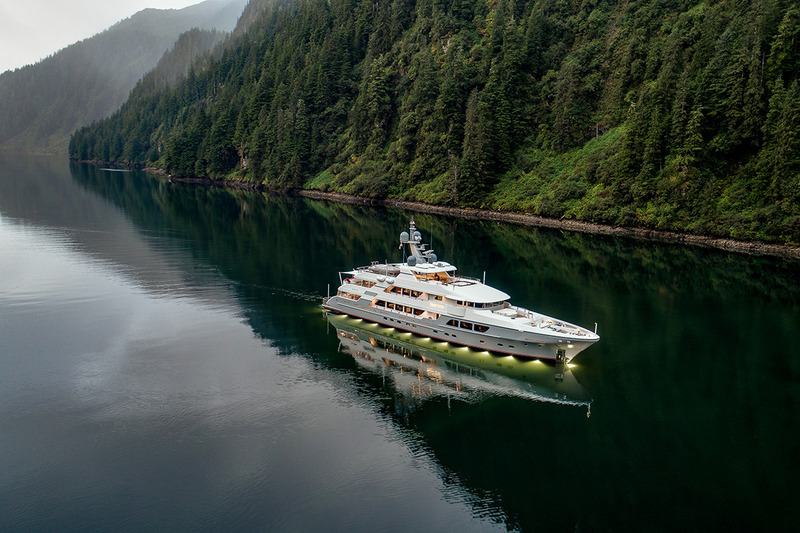 Built by Delta Marine in 2017, this 50m/164ft CUSTOM SUPERYACHT features naval architecture and exterior styling of Christensen, who used a composite hull and superstructure for a shallower draft. 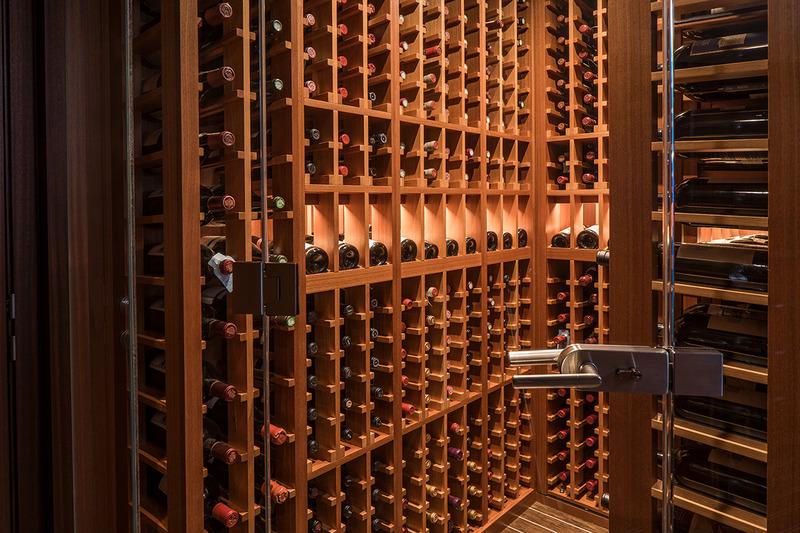 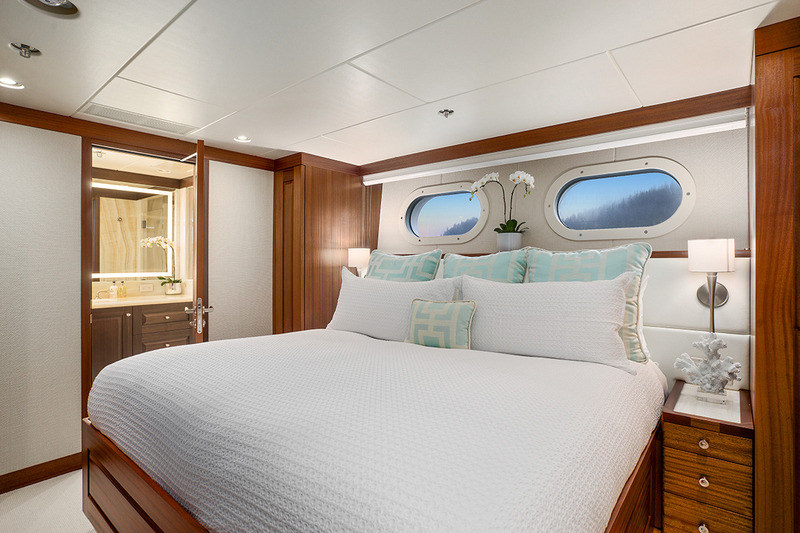 With an exceptional list of amenities for modern luxury yacht charter, including a wine cellar, outdoor cinema and a covered main deck aft, this vessel is designed to be used all year round and sleeps up to 12 guests over six large cabins. 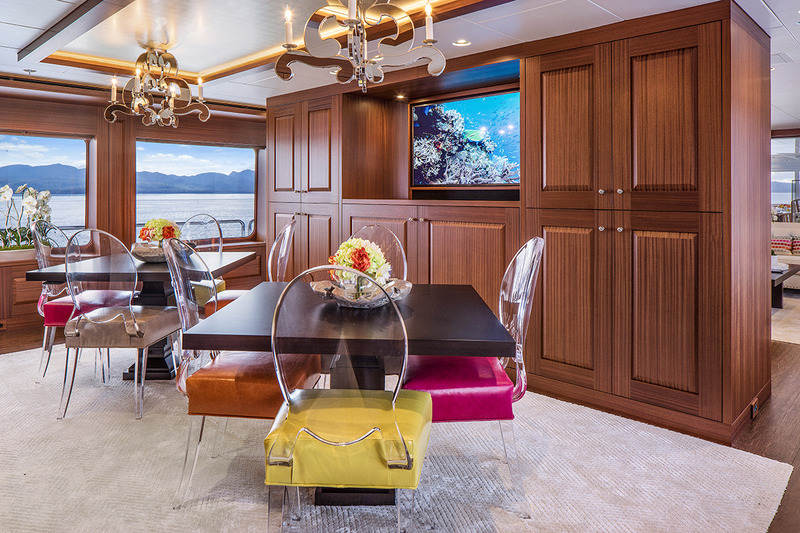 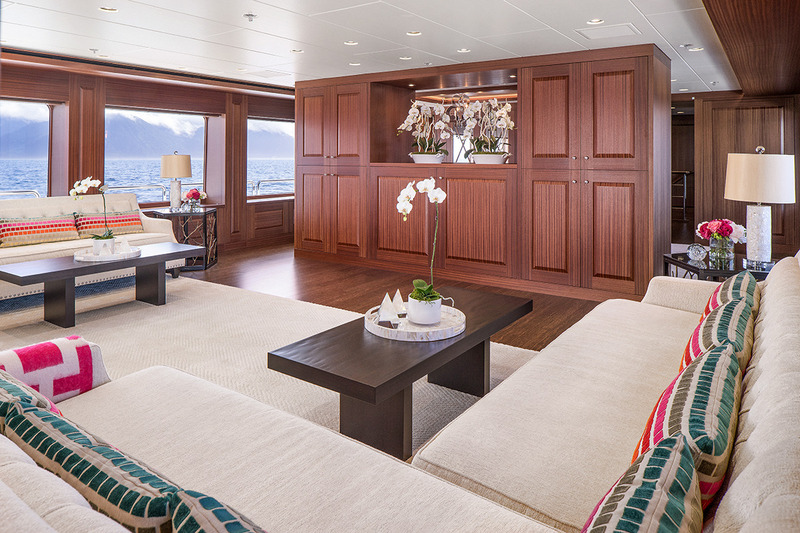 Flowing from the main salon, the aft deck provides a space for guests to lounge out in the open while savouring the selection of cocktails from the corner TV bar. 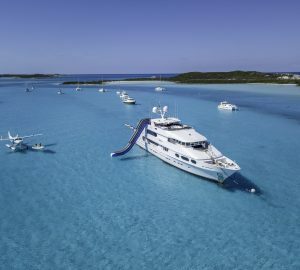 The area can be covered so that it can still be used in windy and rainy conditions, and an internal staircase connects down to the beach club, where guests can sunbathe and easily access the water. 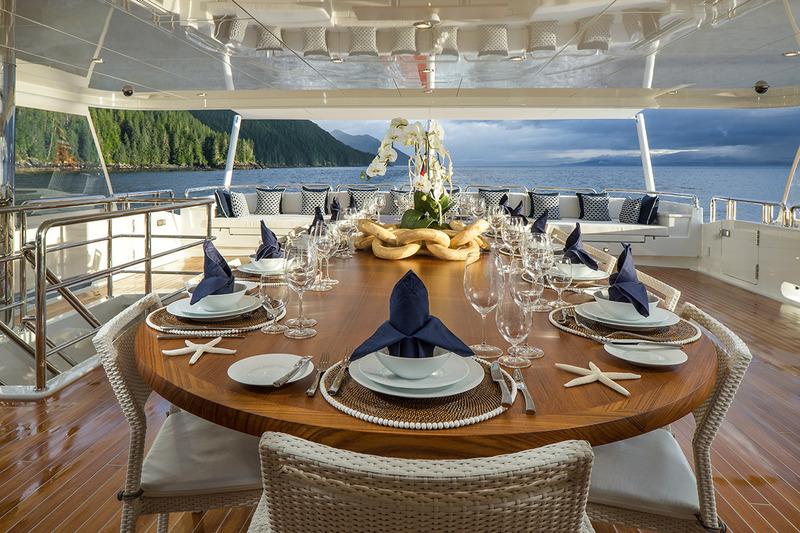 On the bridge deck aft there is an impressive alfresco dining table to seat 16 for atmospheric meals surrounded by the scents and sounds of your destination. 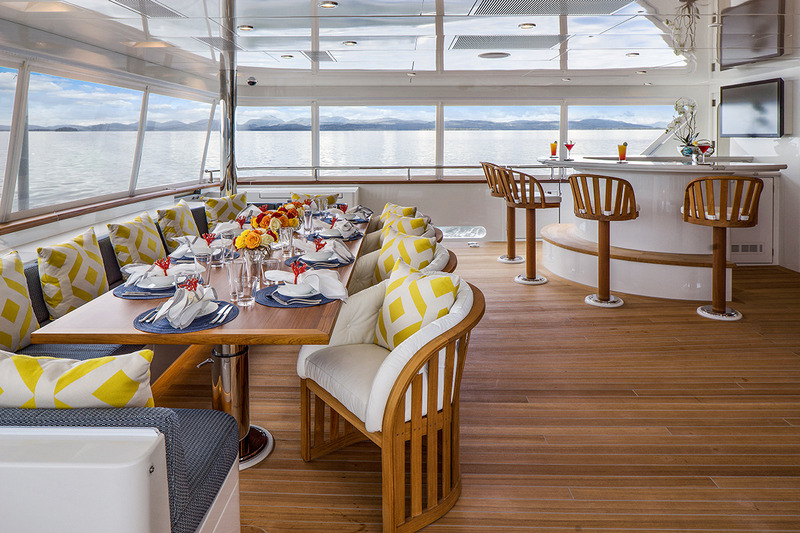 After a meal, there is plenty of seating along the stern where guests can continue the conversation and watch the surroundings. 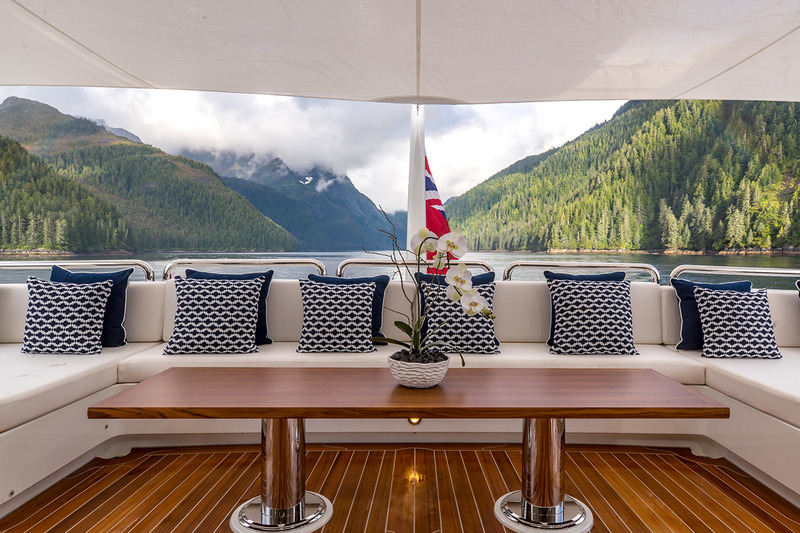 Forward of the helm station, the Portuguese deck offers an alternative outdoor retreat where guests can take in the views and rest in each others' company. 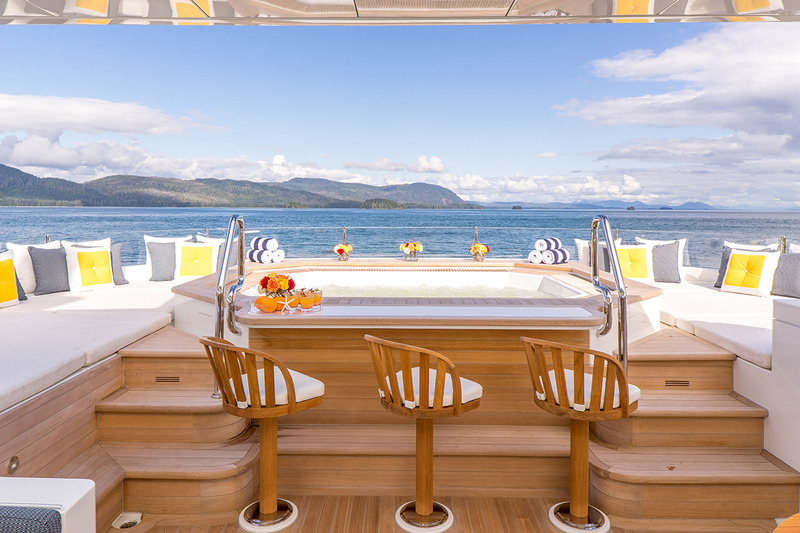 The sundeck aft contains the tenders and a large selection of motorised water toys, which are easily launched a retrieved using a Davit crane. 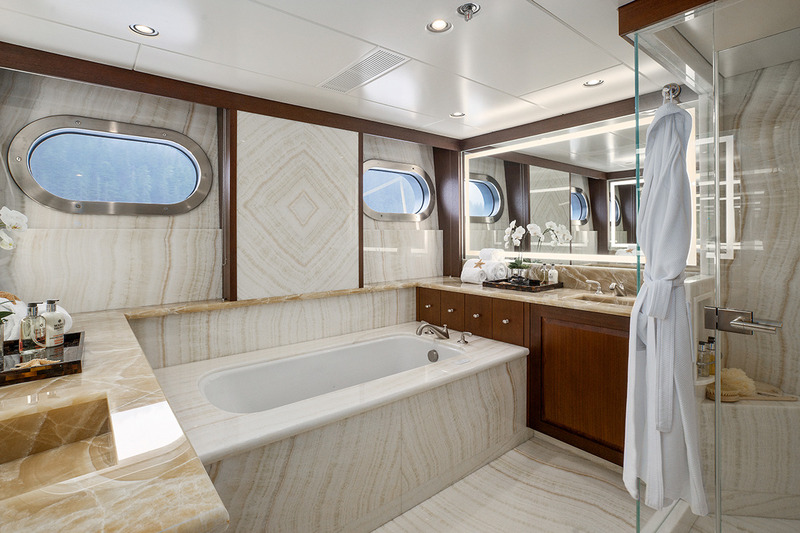 The rest of the space is dedicated to the guests' use and there is a sheltered bar and alfresco lounge/dining area amidships and for taking in the panoramic views while resting there is a large forward Jacuzzi with swim-up bar and sun pads on either side. 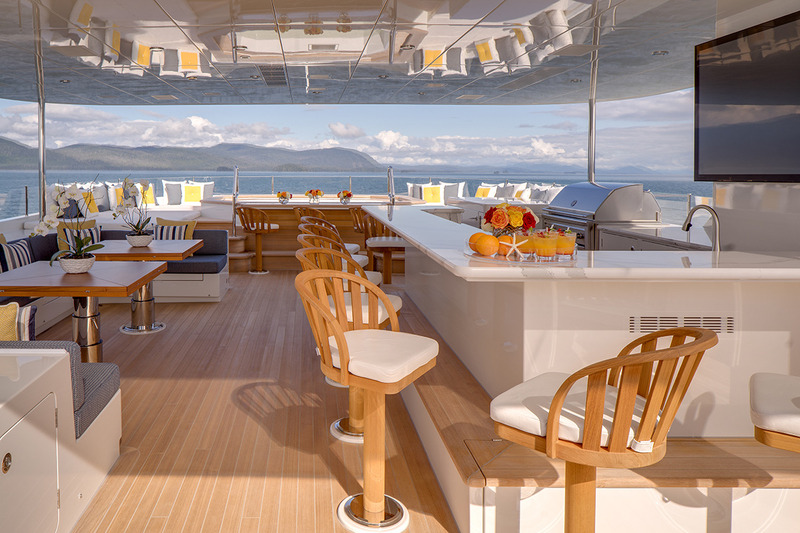 The sundeck can also be used as an outdoor cinema using state-of-the-art audio-visual technology. 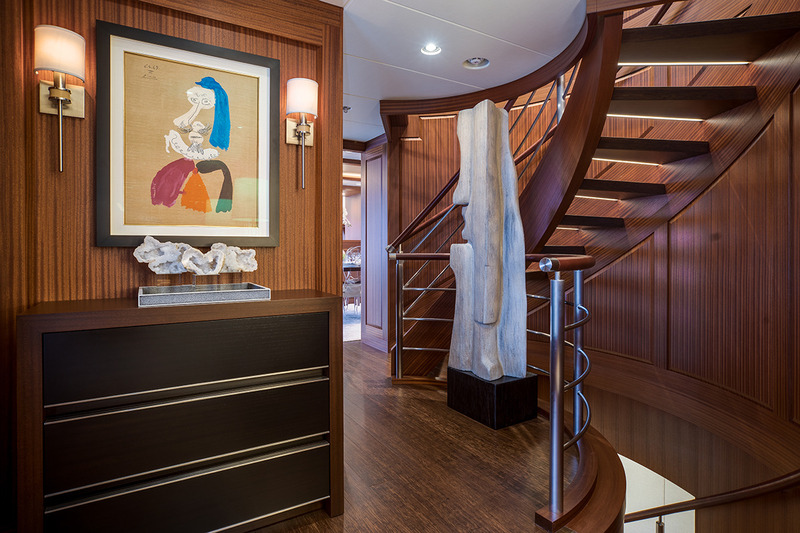 This yacht is fully equipped for a true and autentic ultra-luxurious charter experience. 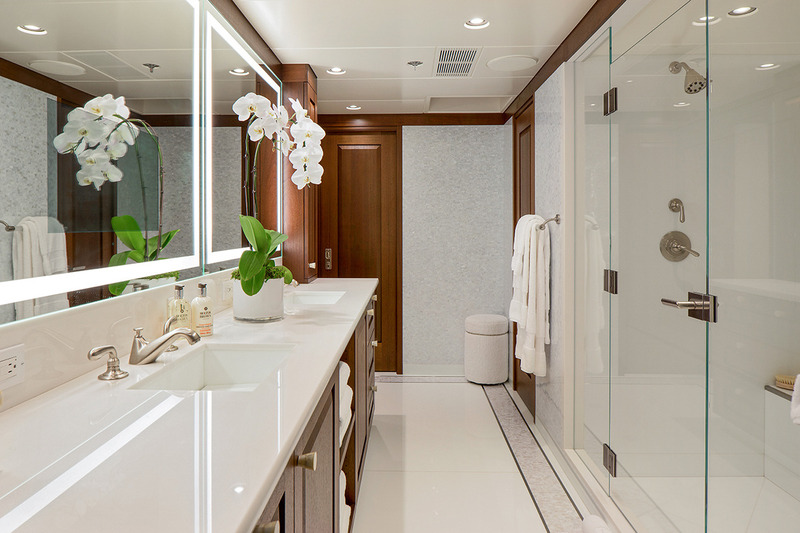 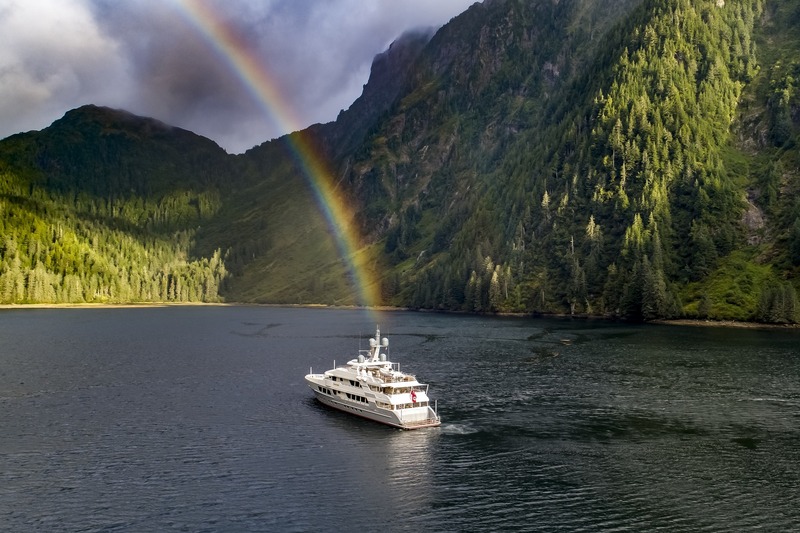 The lower deck contains a spacious stern beach club and gym, forward of which is the engine room and then the VIP stateroom with an en-suite bathroom complete with bathtub. 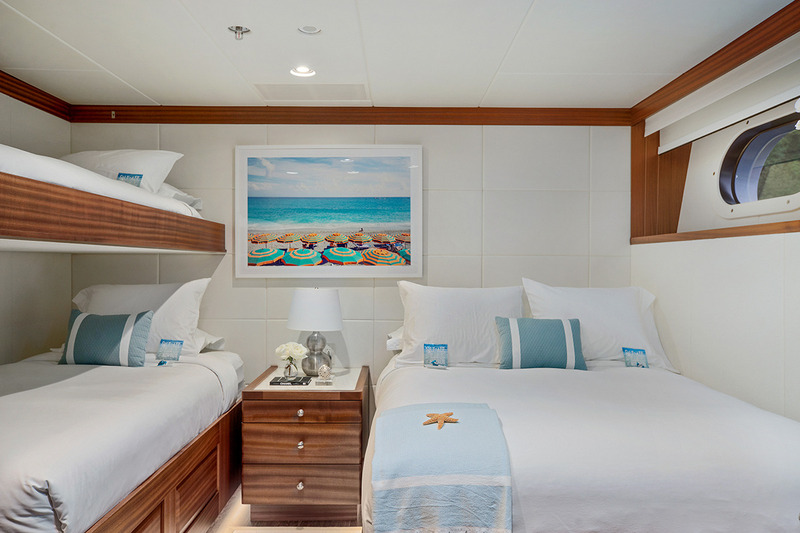 The two other VIP cabins are located close to the hallway and on the other side there is a double cabin with an additional berth and a convertible twin cabin. 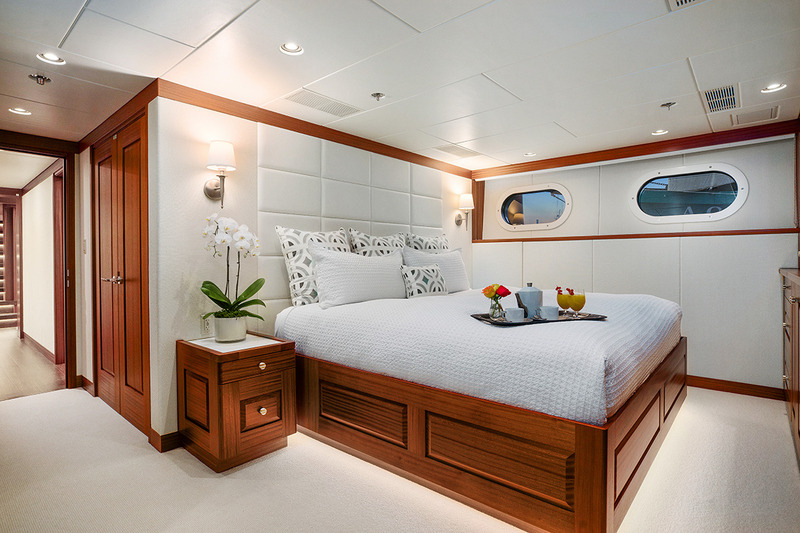 All cabins are designed to be bright and spacious, using white walls and fabrics against minimal wooden furnishings for a clean and contemporary effect. 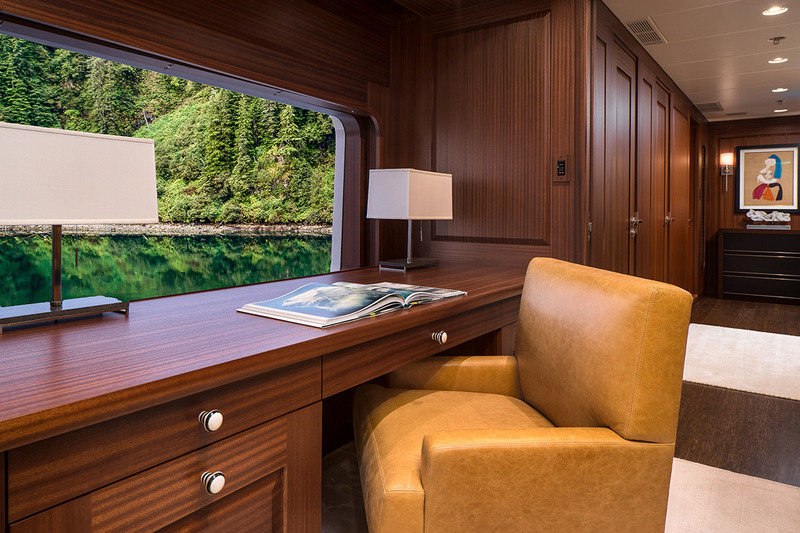 The forward section contains the crew accommodation, which sleeps up to 9. 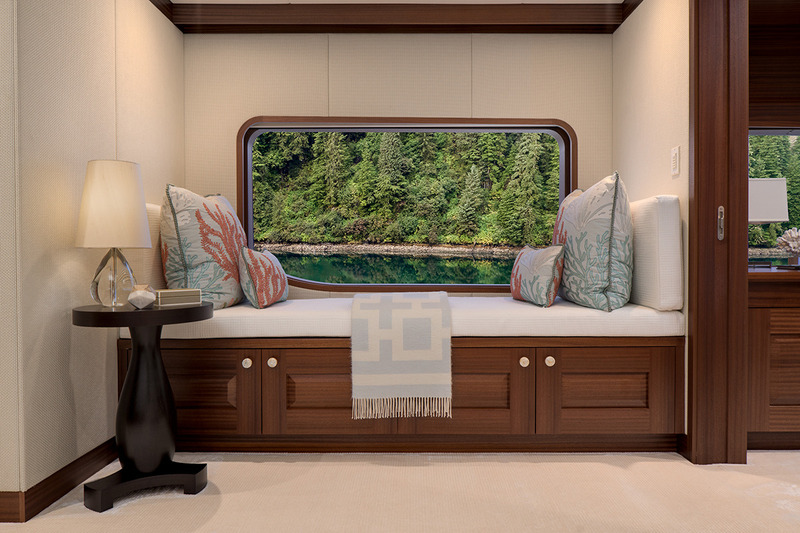 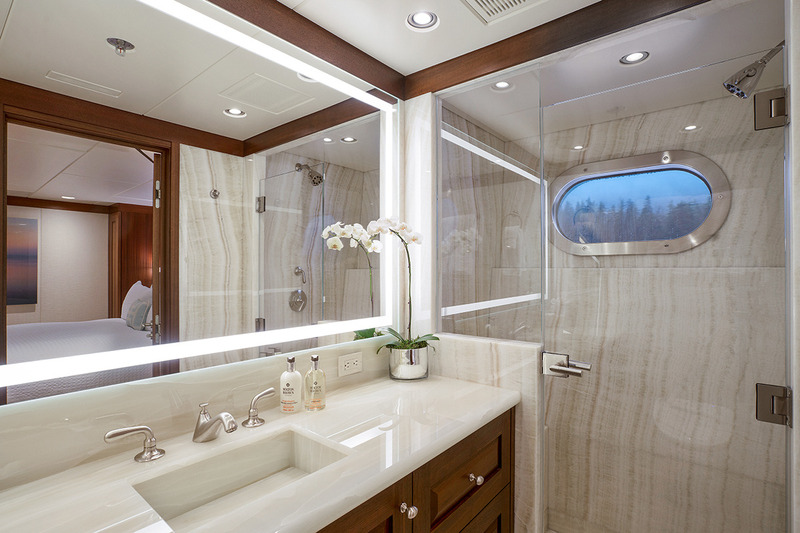 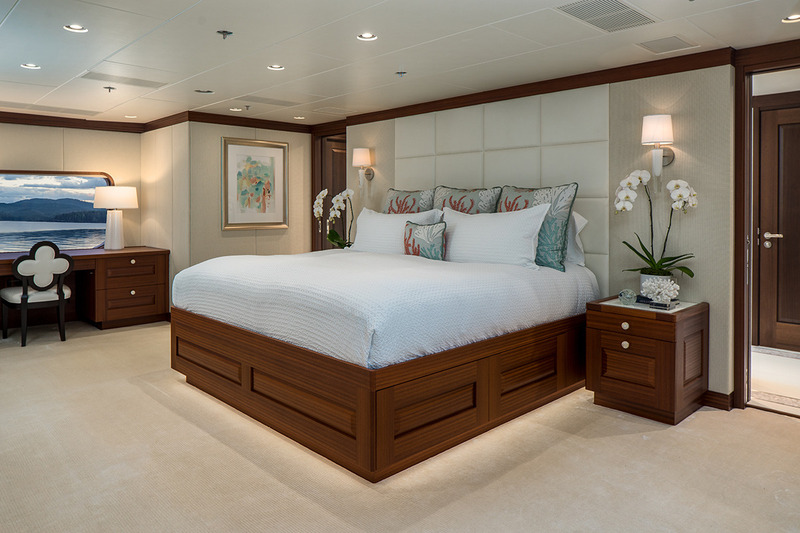 On the main deck, the forward section is dedicated to the full-beam Master suite, within which there is a private lounge/study and two walk-in wardrobes connected to the en-suite bathrooms. 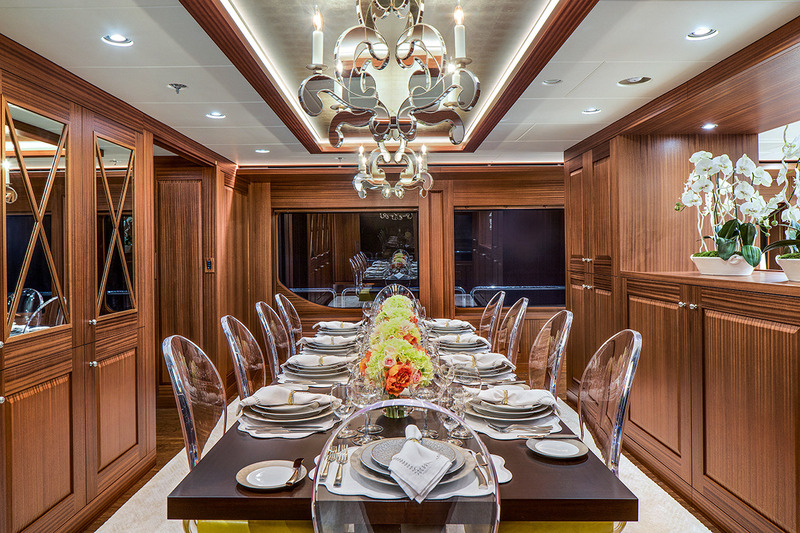 Behind, the lobby leads to the combined formal dining area and salon, where richly toned varieties of wood form an elegant and timeless environment in which to celebrate a meal between 12 people. 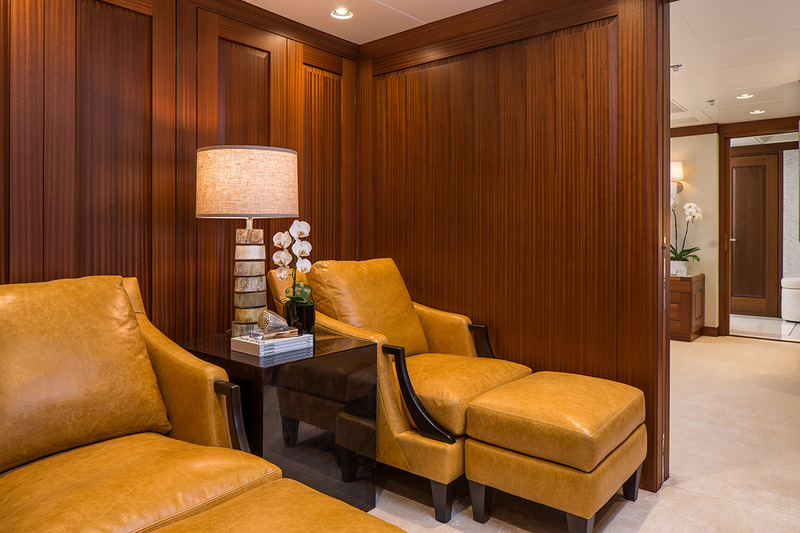 The area can be converted into a casual dining space and there is a concealed television in the alcove for watching films while you dine. 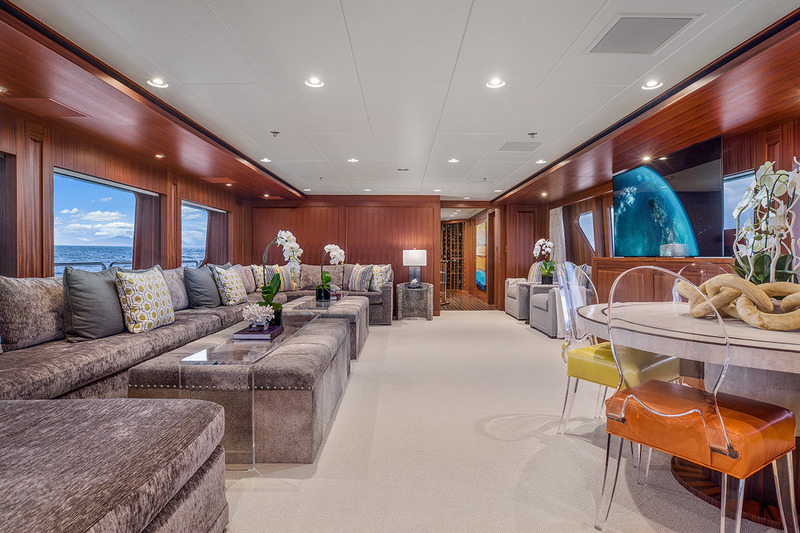 The living area is fitted with two spongy L-shaped sofas with coffee tables placed conveniently in front for a relaxing air-conditioned entertaining space ideal for social occasions and for family get-togethers. 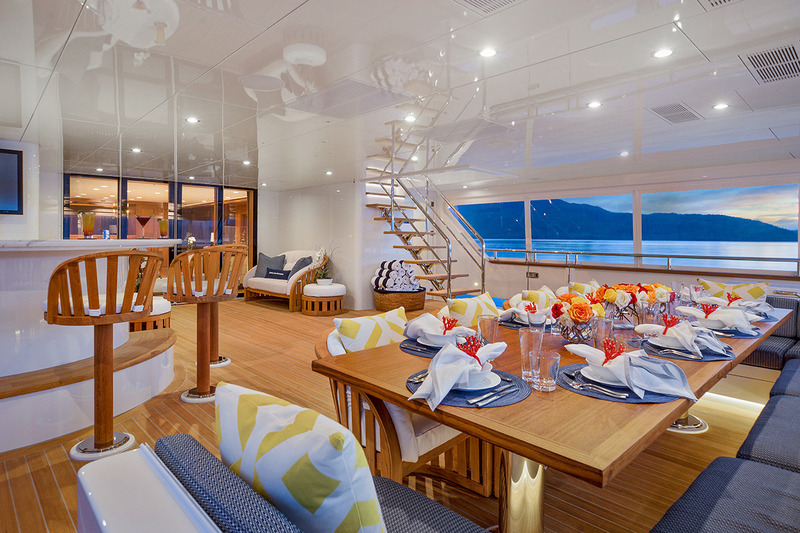 Above, the upper deck has a forward helm station, behind which is a lobby and the sky lounge. 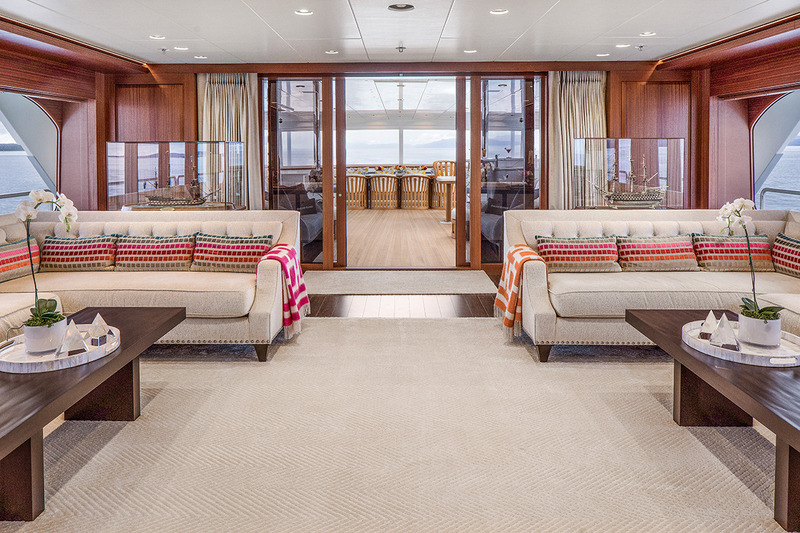 This second living area is ideal as an alternative lounge for the adults or children, offering an abundance of seating all the way along the port side. 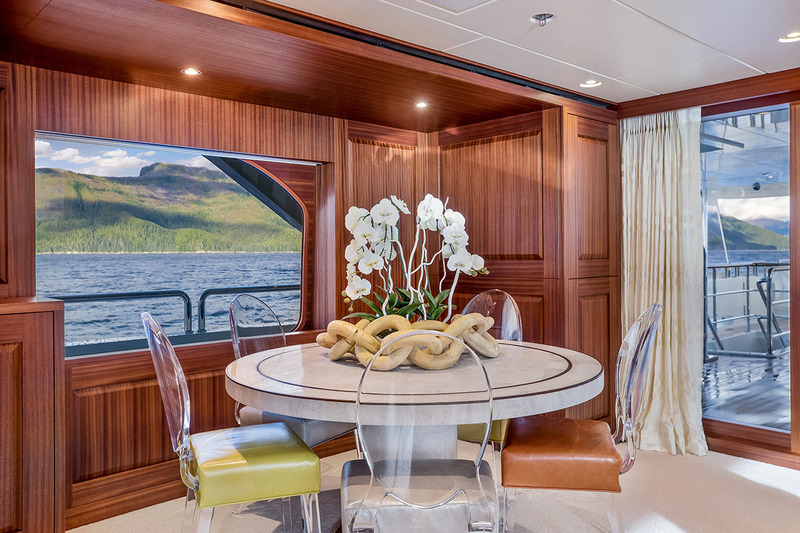 To the aft, there is a circular games table and besides, there is a widescreen TV. 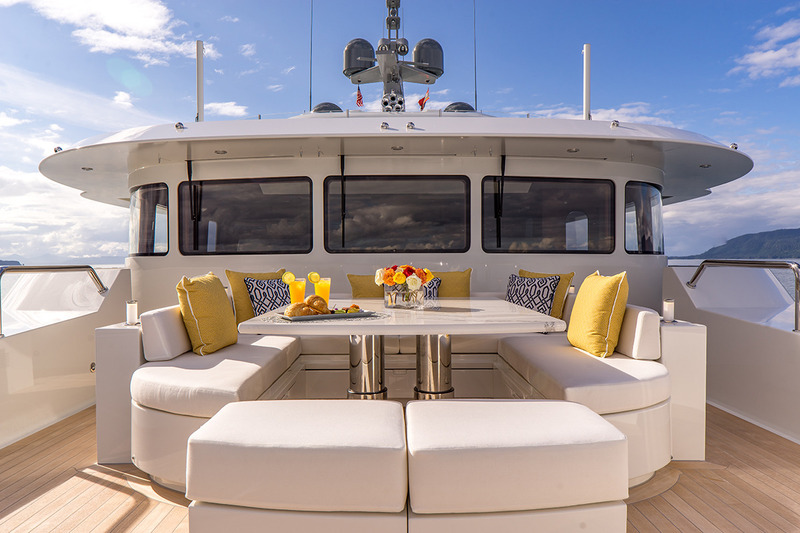 A fold-down terrace on the starboard side allows guests to enjoy elevated views while remaining close to the centre of the action. 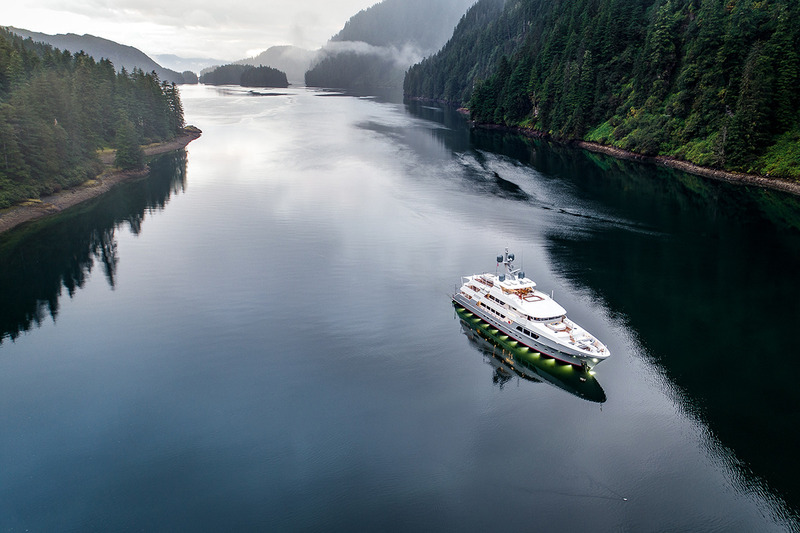 Using 2 x MTU 12V4000 M363 Series engines, the Delta Marine yacht can reach a top speed of 16 knots with a cruising speed of 14 knots and a range of 4,000 nautical miles. 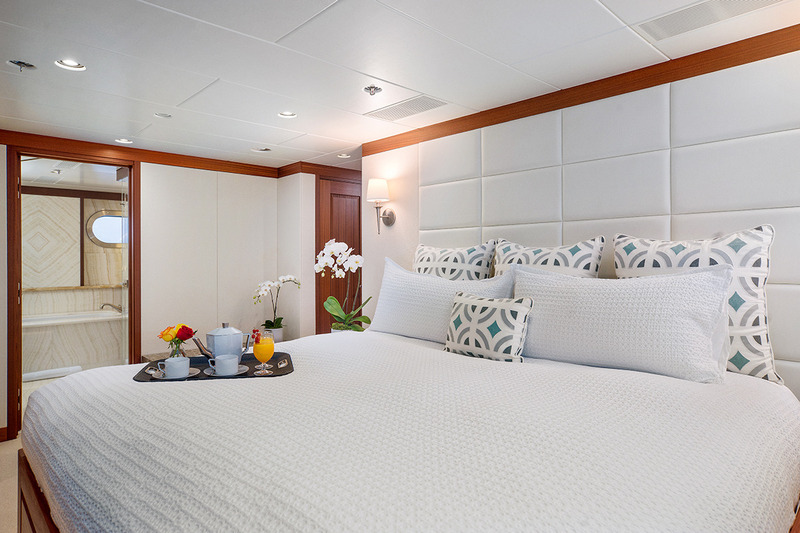 The accommodation is sleeps a maximum of 12 guests over 6 cabins: 1 Master suite, 4 VIP staterooms and 1 double cabin with 1 Pullman berth. 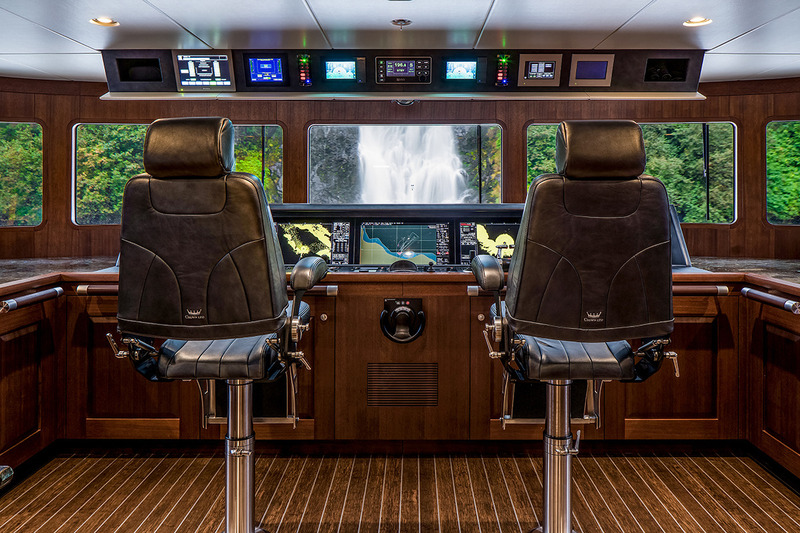 The professional crew of 9 will ensure that everyone on board has a safe and enjoyable journey.